These beauties are all mine. Bob and Carmen looked at each other. The three of us were sitting outside the gym waiting for the instructor. Bob slowly shook his head, and this is how I found out I had made a mistake. I thought Beginning Boxing was taught every Sunday. Nope. It is taught every other Sunday; this was a regular class. Bob looked me over, “You look like you are pretty fit. I am sure you will be fine.” Carmen looked like she had her doubts. Then Joe walked up. I actually know Joe – he was on a freelance job I worked last summer. We reintroduced ourselves. As he shook hands with the others, I looked him over. Joe has huge shoulders and is built like a policeman, or a firefighter. I suddenly had the feeling that this was not going to be an easy class. Then Joe and Carmen started talking about the instructor. (Hereafter known as: TI) “Hey,” she said, “you didn’t come out for his fight.” Joe shrugged and said something about getting busy and losing track of time. “He won,” she said, “but I think TI took it easy on the guy. They had a practice bout last week and he broke the guy’s nose. I think he felt bad.” Before I had a chance to think about that, TI appeared. He was a fairly normal fit looking guy. (I later found out he is a machine.) He waved and ushered us in. I quickly went over and explained the situation. “Have you taken boxing before?” I shook my head. He explained that I really should take the Intro class first, so if I wanted to come back… I felt panicky. I have been looking forward to this for weeks. Maybe he saw something in my eyes, “Or you can give this a try and do what you can. It’s a small enough class that it would be okay. Normally this class is packed, but since it is Father’s Day, we’re pretty light.” I agreed, and he handed me a package of wrist wraps and some gloves. The wraps I would have to buy, the gloves I could borrow. TI quickly wrapped my wrists, explaining what he was doing while the rest of the class got ready. The class was a mix of men and women. They were a motley group, some looked like they worked out a lot, others not as much. 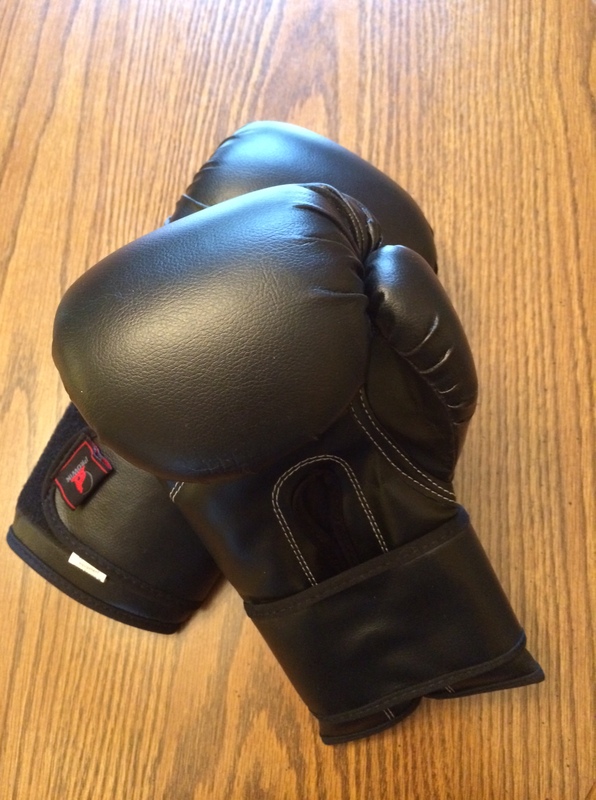 I had somehow gotten the impression that this type of boxing would be mostly women, probably because the two people I knew took it were women and from some disparaging comments made by a MMA fighter I talked to last fall. I like coed groups – they don’t trigger high school flashbacks like all-women groups do. Some in this group looked really tough, and I liked that too. I’d like to look like that myself someday. Then we went and got the jump ropes… Let me just say right now, this class was far, far harder than I had imagined. We did circuits – one minute of floor work followed by one minute at the bag. The boxing portions were okay. I mainly focused on how to hold my body, how to do each move and remembering the sequences. I didn’t worry about how hard I hit or how fast. (A guy next to me was fairly slow but he hit the bag with a staggering amount of power. I did my best to ignore him.) The floor work though… Lord, the floor work. Carmen ended up being my partner. While she was at the bag, I was on the floor and then we’d switch. In between she’d give me little bits of advice whenever she could, but before long we were both just panting and nodding to each other as we passed. TI would do a sequence at the bag and then hop down on the floor to show us what to do there. Each time I felt my face move into an expression of “You want me to do what? ?” A couple times Carmen caught it and laughed. But when it was my turn I gamely got on the floor with a big determined grin on my face and did my best. There was only one point, maybe midway in, when I thought “I am not going to make it.” I felt hot and sweaty and a little weak in the knees. Fortunately a moment later TI called break and I had a chance to catch my breath. After that, I was good to go. By “good to go” I do not in any way mean I was able to complete each set. I did what I could do, and by the end, I’ll admit, I rested more than I moved, but I gave it everything I had and then some. I haven’t tried that hard at anything in a long time. Even though there was a lot I couldn’t do, I still felt pretty good, and when TI came over and fist bumped my glove, I almost teared up a little in pride. I will definitely be back. In fact, I went ahead and bought my first set of gloves. This entry was posted in Boxing, Health and Strength and tagged Boxing, Feeling Good, Health, Motivation by GRLife. Bookmark the permalink.